Working at home means most days are lazy shadow days, so I've become sort of a resident expert when it comes to keeping things simple on the lids. These are the perfect products to make you look like you tried a lot harder than you did. My usual motive. I picked up a handful of the KIKO Long Lasting Stick Eyeshadows in a variety of wearable shades when I was in Italy a few years back. They're great to swipe a bit of product on the lids and then do a quick blend in with the fingers. No brush necessary? Now that's super lazy. Another great lazy option is the Eyetini Shadow in "Ambrosia" that stumbled into my collection from an Ipsy bag quite a while back. 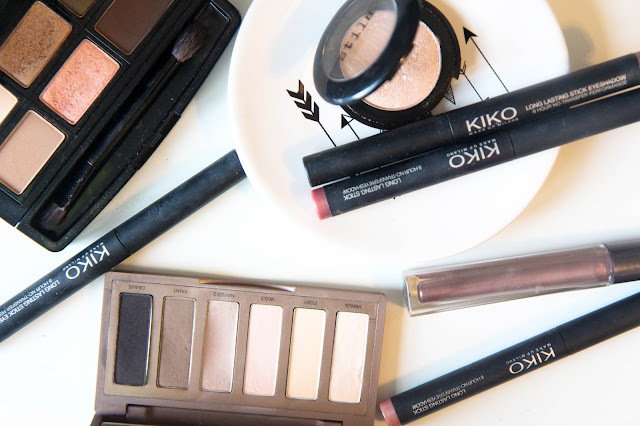 Its wand applicator acts just like the KIKO sticks in slapping product on the lids in seconds flat. Now if you aren't going full on lazy day and can be bothered to pick up a brush, the Urban Decay Basics Palette or the butterLONDON Shadow Clutch in "Natural Charm" are two seriously amazing neutral options. They're great for a sweep of shadow or doing a little bit more shading and blending. If one shadow will do you then nothing beats the Stila shade in "Kitten." It's safe to say this is my single most used shadow and one of a slim few that I have as a single packaged shade. It the most gorgeous shimmery champagne shade that brightens up the lids and overall face with barely any effort. I'm sold. What products do you use for lazy shadow days?